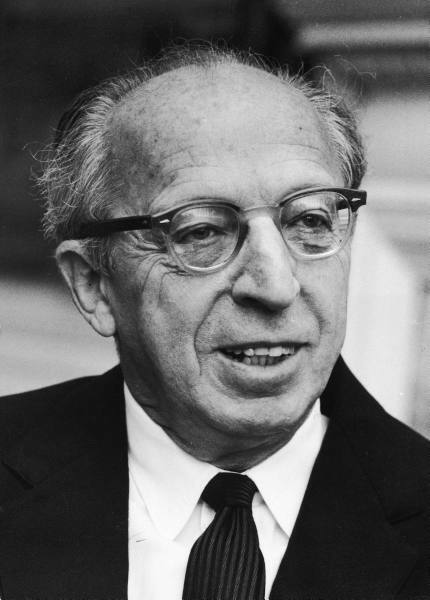 Aaron Copland was born on the 4th November 1900 in New York City, of Lithuanian Jewish descent. He was brought up in a flat above his father's Brooklyn store in a family of enthusiastic amateur musicians. His composition career began at the age of 15 with a correspondence course on harmony writing, but only really took flight at the age of 21 when he went to the Fontainebleau school to study with the famous Nadia Boulanger. His first major work was a Symphony for Organ and Orchestra, and was dedicated to her. Copland's compositions are typical of the musical melting pot of America in the twentieth century. They use folk and jazz idioms, percussive orchestration, changing meter, polyrhythms, polychords, and the tone rows of Schoenberg. He gained great popularity in the 1930s and 1940s by combining these elements in a simple easy to understand musical language. His later works were often more radical and less popular. Copland stopped composing in 1970, though he continued to lecture and conduct through the 1980s. In 1986, he was awarded a Congressional Gold Medal for "creating a uniquely American style of composition". He died on the 2nd December 1990 in Tarrytown, New York, after suffering from Alzheimer's disease for several years. The phrase in the poem is a metaphor for inspiration, and bears no relation to the story of the ballet. Copland found great amusement from the critics who credited him with "capturing the beauty of the Appalachians", and who thought that "Spring" referred to the season rather than a source of water. In 1945, Copland made an orchestral suite from the original ballet, containing most of its music. This later version was to become one of his most popular works. The ballet is set in Pennsylvania in the 1800s, and describes a newlywed couple, their neighbours, a revivalist preacher and his followers. The orchestral version is divided in eight parts as follows. Very slowly: Introduction of the characters, one by one, in a suffused light. Allegro: A sudden burst of unison strings in A major evokes a scene of religious elation. Moderato: A dance for for the bride and her fiancee full of tenderness and passion. Quite fast: A description of the revivalist and his congregation in a country folk idiom. Presto: A solo dance for the bride expressing extremes of joy, fear and wonder. Very slowly: A brief reminder of the opening section. Calm and flowing: Scenes of daily activity for the bride and her farmer husband. This is a set of five variations on a shaker song called "Simple Gifts". (The shakers are a Christian group who believe that God is found within the self, rather than through clergy or rituals.) Copland had come across the tune in a collection of shaker melodies compiled by Edward D. Andrews, and found that it perfectly matched "the kind of austere movements associated with Graham's choreography." Since the composition of Appalachian Spring the melody has become highly popular and has appeared in many popular arrangements. Moderato: The newlyweds are seen "quiet and strong in their new house." Muted strings intone a hushed prayer-like chorale passage. Down a Country Lane was originally composed for piano in 1962 following a commission by Life Magazine intended to make high quality modern music available to the common pianist and student. The magazine article stated that "Down a Country Lane fills a musical gap: It is among the few modern pieces specially written for young piano students by a major composer." Like Appalachian Spring the title was not given to the piece until after its composition. Copland wrote of it: "The music is descriptive only in an imaginative, not a literal sense. I didn't think to the title until the piece was finished - 'Down a Country Lane' just happened to fit its flowing quality." The piece is in a simple ternary form. The opening section is described as "gently flowing in a pastoral mood". The short middle section is slightly faster and more dissonant, but the piece soon returns to the mood of lyrical calm. The orchestral version of Down a Country Lane was created for inclusion in a Youth Orchestra festival and was premiered on November 20, 1965 by the London Junior Orchestra. Appalachian Spring and Down a Country Lane were performed by the Portobello Orchestra on the 10th July 2010, conducted by Anthony Weeden.